Ruben Lopez of Poteet, passed away Monday, January 29, 2018 at the age of 59. 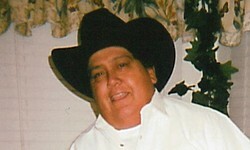 He was born in Pleasanton on January 17, 1959 to Juan and Maria (Quinonez) Lopez. Ruben is survived by his brothers, Ysidro Lopez and Juan Lopez and wife Leisa and sisters, Linda Casias and husband Manuel, Terry Hernandez and Gloria Navarro. He is also survived by numerous loving nieces and nephews. Ruben is preceded in death by his parents, Juan and Maria Lopez; wife, Sandra Wright; sister, Virginia Roman and brothers, Henry Lopez and Alex Lopez. Visitation was conducted at Hurley Funeral Home in Pleasanton on Sunday, February 4, 2018 from 2 – 9 p.m. Graveside service was at the Bautista Cemetery in Christine on Monday, February 5, 2018 at 10 a.m.